It is ages and ages since I've linked to WOYWW and I've missed having a nose at everyone else's workdesks, although, admittedly I do 'see' quite a few WOYWWer in my wanders through blogland. If you don't know what I'm talking about have a click on WOYWW 274, have a nose around ... and more importantly, share a photo or two of your workspace for others to visit. I've often thought of 'returning to the fold', so to speak ... and at last, here I am!! I'm excited to show you my workspace, because a big parcel arrived yesterday - I wonder if you can spot what was in it? 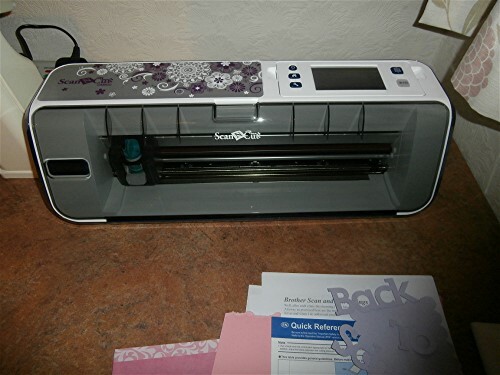 Because I needed to make room for my new toy - the Brother Scan n Cut. I powered it up today and cut a few shapes - that's as far as I've got. Here's the new toy in all its glory! Now I have a dilemma. I have lots of cards to make (I'm now on lots of Design Teams, which is wonderful, but does mean that I need to keep up with getting things done. Do I get ahead with all those commitments, so that I can then play with the new toy ... or do I play with the new toy and then get everything done in a hurry after that. And, the big thing that I've needed to do for ages and need to do even more now is have a sort out!! Having bought a new unit a few months ago housing quite a number of Really Useful Boxes, I promised myself that I would have a good sort out ... it hasn't happened yet. Those who know me well, know that I like to be organised, so I do need this sort out. Watch this space ... you never know, I might be able to come back next week and show that the sort out is in progress. 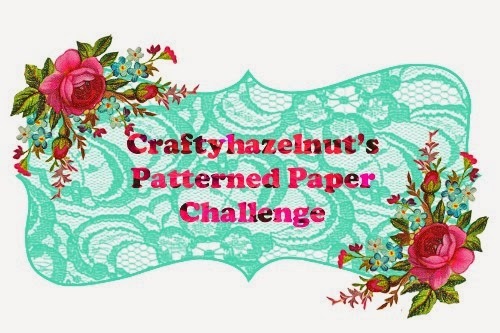 Update: If anyone's interested I've just made a card using some cuts from the Scan n Cut - it's here if you'd like a look. Wow, Hazel...that is one organized desk! Your desk is inspiring! I like your new toy. I say you should definitely try to squeeze some play time in! How lovely to see you here on WOYWW again Hazel. Have taken part in a few of your challenges over the months - but not often, I'm afraid. Life has been a little manic!! 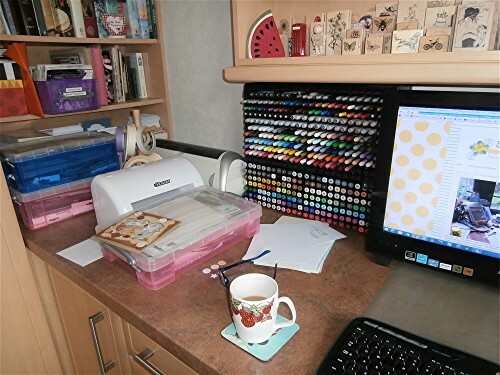 An amazingly neat and tidy workspace - and oh, what a dilemma for you.... I'd probably do the "must do" and "urgent" tasks first - whilst at the same time muttering that I wanted to be doing something else! Thanks for visiting - yes, it was an exhausting day, as I drove all but 25 miles of the 400... but a very worthwhile trip. SO good to see the family - not seen much of them with John having been so very ill. However, they are always willing to come to Wales! Can you blame them? Sun, sea and mountains!! I have no idea what your he toy is but I hope you find the time to play with it. I'm sure you will have lots of fun. Ooh, A Scan'n'cut, I think you will get lots of fun out of it, do share. Your work place looks so organised already but no doubt you will enjoy a sort out and will find those exciting things you'd forgotten you had. Now I will go away and sulk in my jealousy and try to convince myself that I do not need a scan'n'caut. I love your work space and hope you have fun with your new toy. You are going to love that machine, I love mine to bits and that fussy cutting is a thing of the past and to cut what you want it too. Oh fun times are ahead for you. Have fun with your new tool. I use a Silhouette and love it. I don't know why I waited so long to get a digital cutter. I find if my "commitments" don't fulfill my artistic needs for play and creativity, I don't do them. You are definitely well organized! And what a dilemma! I would want to play but can you combine playing with your DT projects? Thanks for popping by and Happy WOYWW! I am loving your craft area. Your new toy looks fab. You'll have loads of fun with that. Oh wow Hazel, you have the cut and scan! You are a gadget freak like me! I doubt I will be able to afford one of those now that Shaun has taken flexible retirement, on top of me taking early release a couple of years ago! 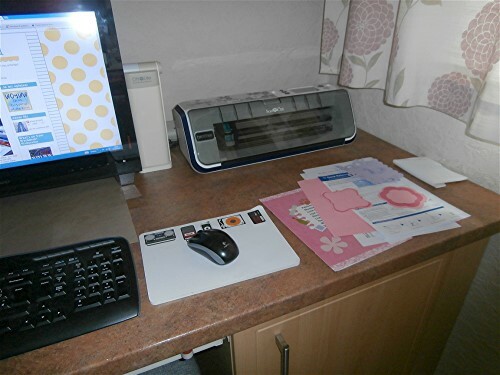 Yes the ebosser can be wonderful - but it lets me down so many times, hence the new manual machine. What a pretty card you made with your new tool/toy! I don't suppose you could use it to help you with all your commitments? 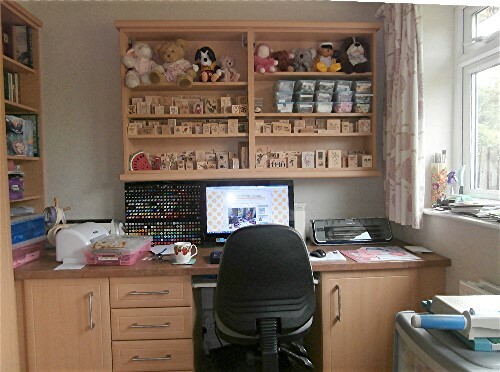 I love the look of your creative space, Hazel - nice and light, and I like the pale wood - AND all those gorgeous teddies!! Well done getting your new machine, and I am sure you will have a lot of fun with it. Your whole space looks very organised. Thanks for your visit and your nice comment and I'm so glad you like my card, and also my new-look office with its red rug! I am very happy with how it's turned out. Thanks for your visit - lots of seed trays now filled with little plants, looking forward to beautiful plants next year. love your workspace - so sunny! congrats and the new machine - have a blast with it! Hi Hazel, I've linked into WOYWW for the first time and I'm happily snooping around. I can tell by your desk that you are an organized person. So neat and clean! I love your working space, it is very nice and look at all those pens - wow! What a great room! I love how all those wood mounted stamps are right there! Wish I could do that with all mine. I'm interested to see what you think of that new machine. OOOOh!!! So exciting!! I've heard lots of good thing about the Scan and Cut. You'll have to let us know how you like it. And I totally vote for playing first and working later! Haha! Or figure out how to combine the two!